Strange, but although my usual interests are 1/76 scale British vehicles, I seem to be spending quite a lot of time building 1/72 Russian vehicles. I think this is a reflection upon the increasing numbers of interesting 1/72 vehicles from eastern Europe. This model from Ace is very much a case in point. I found it an enjoyable model to build with well fitting parts and an interesting range of possibilities for finishing. 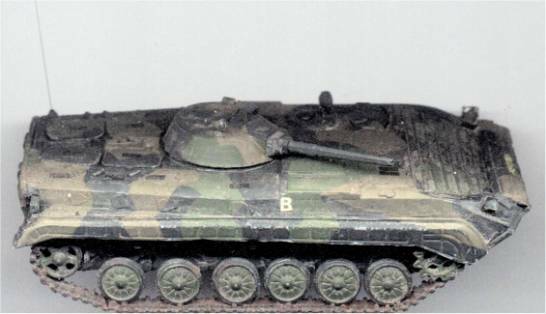 Apparently, this version of the BMP-1 is a post unification German health and safety upgrade to the basic vehicle. The converted vehicles were eventually sold on to Greece and Sweden. Naturally, being perverse, I decided to build mine as a Swedish vehicle, although there are no Swedish markings provided in the kit. From pictures of the real thing, I concluded that the principal differences for this version appear to be absence of wing mirrors and grenade projectors. Anyway, having found quite a few pictures on the web and rather liking the camouflage pattern, this is the version I built. Markings were from my decal scrap box. I have tried all manner of small scale tracks. Vinyl tracks as used in the old Airfix kits, by Fujimi and by Matchbox, to name but a few, can be OK, but tend to be over thick, difficult to position realistically, and are generally awkward to handle and paint. There is also the possibility of "track rot" where the plasticiser in the track migrates into the polystyrene of the model causing eventual melting of the plastic. Fully moulded track and suspension units like, for example, those in Minitanks are also less than satisfactory and suspension details in particular can be poor. Extratech's etched brass tracks are very fiddly to assemble (I have resorted to using a stereo microscope on occasion), but look fantastic when finished. I have used embossed heavy aluminium foil with fair results (see the Skif T-26 review), but don't know how practical this would be for commercial manufacture. I've not seen it done. Vacuum formed tracks I have found cumbersome, not crisp in detail and generally undesirable. Resin tracks that may be thermo-formed with hot water or a hair dryer are ok, but very difficult to get to sit just right. These are used by Modelkrak, for example (see my T-28 review). This leaves injection moulded track lengths with individual links as my favoured option (except when feeling masochistic and and on good terms with my microscope). I would ideally prefer to have sufficient multiple link lengths to do the whole track length, with individual links supplied as well. This gives the option to bend longer lengths around sprockets, etc., if desired, but also allows the use of individual links for those that prefer this. Spare links are also always useful for stowage and for the bits box. Back to the BMP. I wanted a faded dusty finish for this model and achieved this by preparing a suspension in waterof sifted fine ash from our wood-burning stove, with a drop of office gum as binder. The model was then washed all over with this and allowed to dry. A thicker version of this suspension may be used to simulate mud. Once again, our cat Bumble proved to be a good source of a nice black whisker for use as the aerial. She wasn't impressed, but will grow another quite quickly! - she's just hoping I don't go into mass production. All in all, I liked this kit and would recommend it as giving a very satisfying final model. Finally, I would like to say that I was most impressed with the Ace website. It is refreshing to see a manufacturer who actively seeks dialog with his customers. I wish Ace every success - it is most deserved.